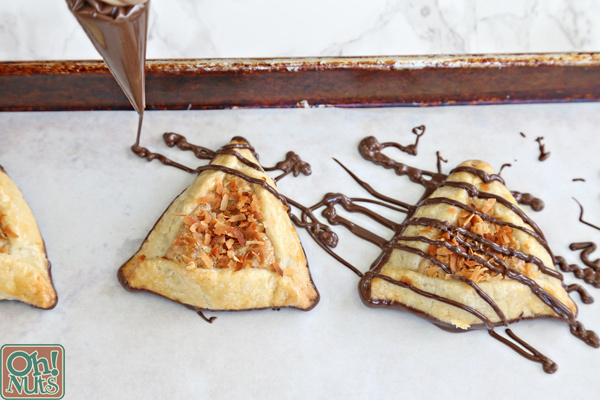 These Samoa Cookie Hamantashen are a fun twist on a classic Purim cookie! 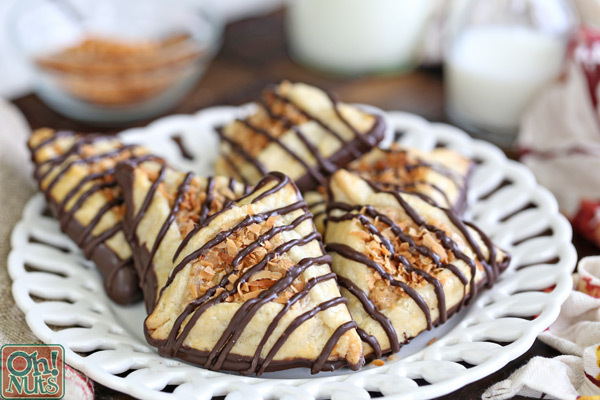 This version has a flaky, crispy crust, a filling packed with toasted coconut and chewy cararmel, and a big drizzle of chocolate! Purim falls in the middle of one of my very favorite times of the year–Girl Scout Cookie season! Our house has been overrun with boxes of peanut butter cookies, Thin Mints, and–my personal favorite–Samoas. (In some areas of the country they’re called Caramel deLites, but I’m from a strictly “Samoa” region, thank you very much.) These classic cookies are made with a shortbread base, a chewy layer of caramel and toasted coconut, and a drizzle of chocolate to finish it off. When I was brainstorming fun hamantashen recipes for Purim, my eyes kept drifting back to those boxes of Girl Scout cookies. 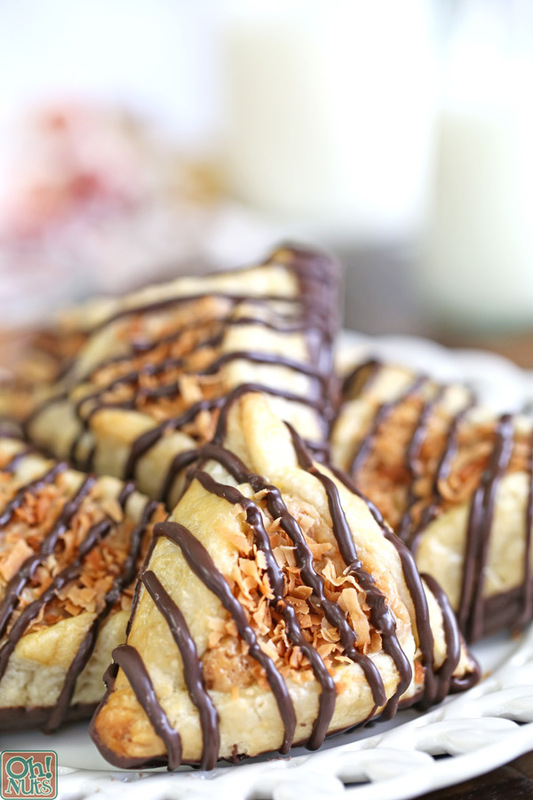 Could I… should I… would it be possible to create a hamantashen recipe with all those Samoa cookie components? Dare I try?? Spoiler alert: I could, I should, I DID, and they are amazing! These are truly one of my favorite cookies I’ve ever made, and I am not saying that lightly. I’ve had a long-term love affair with chocolate chip cookies for decades, but these sweet little triangle beauties might knock them from their #1 status. Let’s run through these cookies briefly. I actually made them with pie dough, for a few reasons: it’s super flaky and buttery, it’s not too sweet (to counteract all that caramel and chocolate! ), and it’s really convenient and easy to use. The filling is a special caramel that bakes up beautifully–most caramels, when you bake them, either bubble up and escape the cookie entirely, or become so hard and chewy it’s impossible to eat. This one stays soft, even after baking! 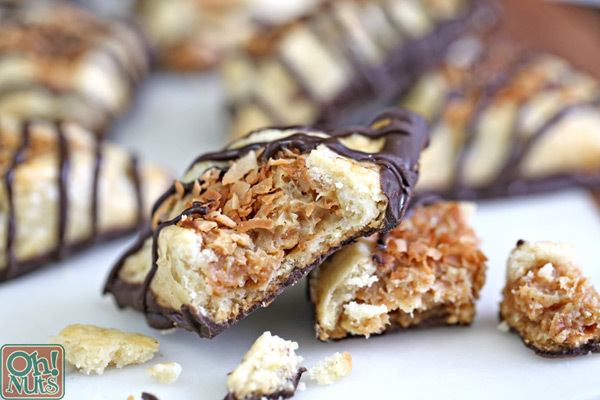 There is a TON of toasted coconut in these cookies, which gives them an incredible flavor. And finally, the bottoms are dipped in chocolate, and more chocolate is drizzled across the top. These cookies are everything. The different flavors and textures make them ridiculously addicting. 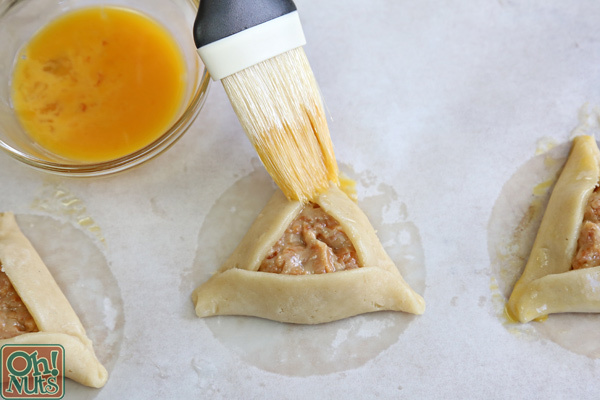 They’re great for Purim, yes, but I’ll bet that once you try them, you’ll want to make them all year round. Here’s how it’s done! Preheat the oven to 350 F. Spread the coconut out on a rimmed baking sheet. Toast the coconut in the oven until it is a medium golden brown color, stirring after every 3 minutes to prevent it from getting burned. This may take anywhere from 12-16 minutes–it depends on how moist your coconut is and the size of your baking sheet. Be sure to keep an eye on it towards the end of the cooking time, as it tends to toast very quickly at the end. While the coconut is toasting, you can multi-task and prepare the caramel (as long as you don’t forget to keep stirring that coconut periodically!) 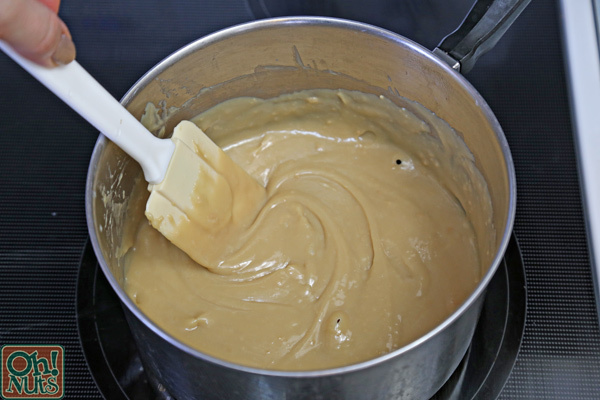 Combine the butter and brown sugar in a medium saucepan, and place the pan over medium heat. Stir occasionally while the butter melts and the sugar dissolves. While it cooks, it will go from a pale, thin mixture to one that is darker and much thicker. After 5 minutes, remove the caramel from the heat and transfer it to a shallow bowl to cool to room temperature. Let the toasted coconut cool as well. 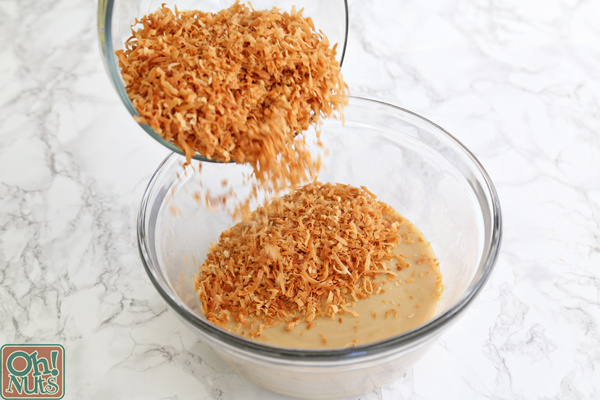 Once the caramel is no longer hot, add most of the toasted coconut, reserving about ¼ cup of it for later use. 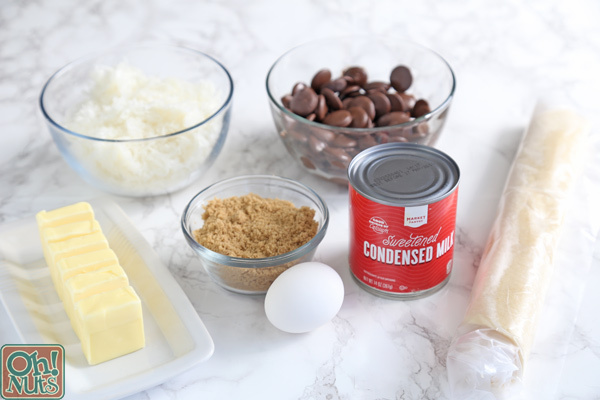 Stir together the coconut and caramel. 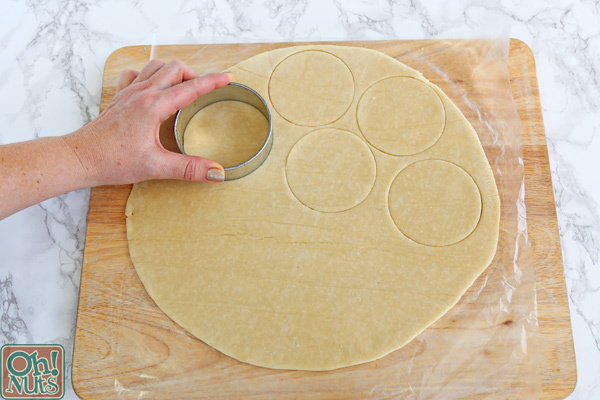 Raise the oven temperature to 430 F. Unroll the pie crust sheets, and use a cookie cutter to cut out circles about 3” across. 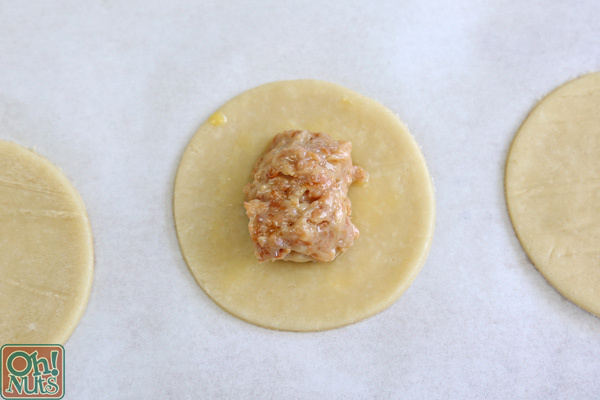 Re-roll the scraps of dough as necessary to yield about 30 circles. Place them on baking sheets lined with parchment paper. Brush the tops of the pie crust circles lightly with the beaten egg. Scoop up a tablespoon of the caramel-coconut mixture and place it in the middle of each circle. Fold the edges in to form a triangle shape, and brush the outer edges with more egg wash.
Bake at 430 F for 15 minutes, until puffed and golden. As soon as the trays are out of the oven, press a pinch of toasted coconut in the middle of each, on top of the bubbling caramel. Let the cookies cool. Melt the chocolate wafers. Dip the bottoms of each cookie into the chocolate, and set them on parchment sheets. 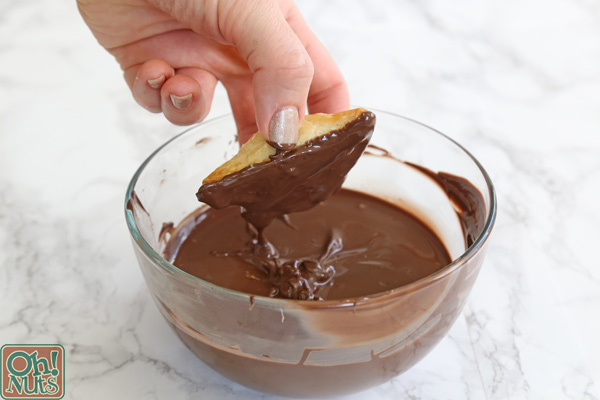 When all the bottoms are done being dipped, transfer the rest of the melted chocolate into a piping bag or a plastic bag with a hole cut in the corner, and drizzle the tops of the cookies with chocolate. Let the chocolate set, and then serve! As always, there’s an easily printable recipe and pin-able image down below. Enjoy, and happy Purim! 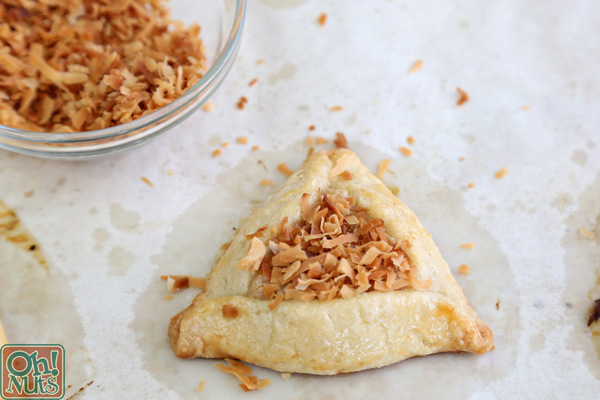 Samoa Cookie Hamantashen are a fun twist on a classic Purim cookie! 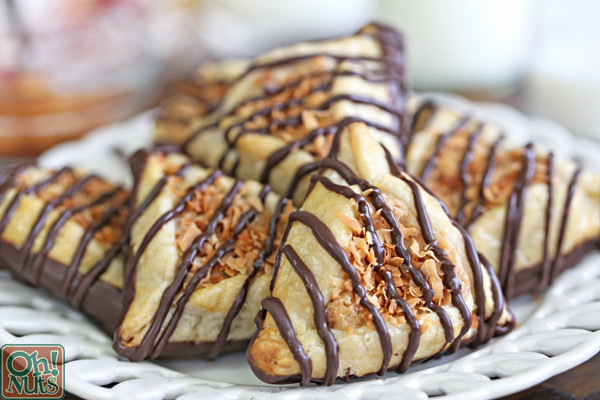 This version has a flaky, crispy crust, a filling packed with toasted coconut and chewy cararmel, and a big drizzle of chocolate! 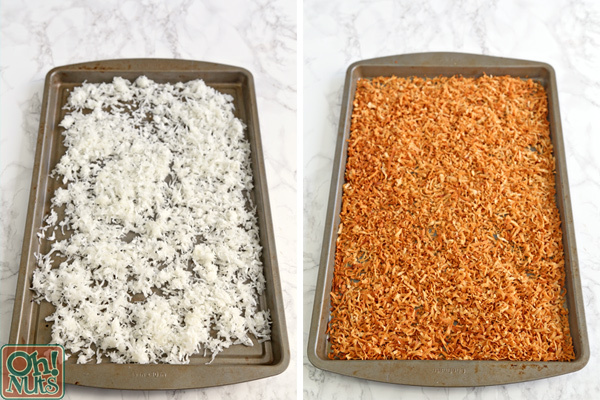 Preheat the oven to 350 F. Spread the coconut out on a rimmed baking sheet. Toast the coconut in the oven until it is a medium golden brown color, stirring after every 3 minutes to prevent it from getting burned. This may take 12-16 minutes. Keep an eye on it towards the end of the cooking time, as it tends to toast very quickly at the end. While the coconut is toasting, prepare the caramel. 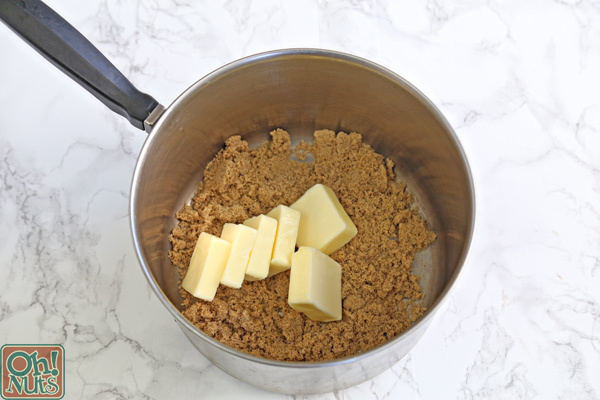 Combine the butter and brown sugar in a medium saucepan, and place the pan over medium heat. Stir occasionally while the butter melts and the sugar dissolves. 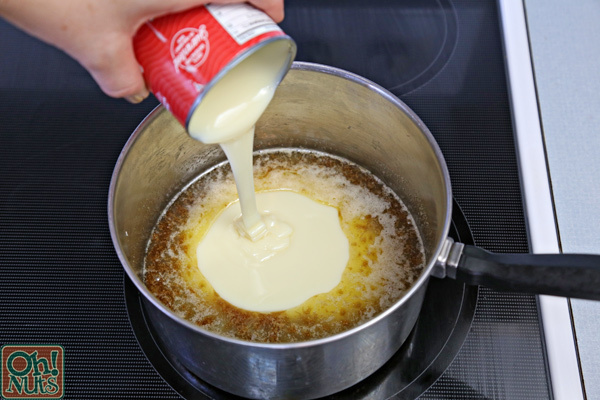 Once melted and bubbling, add the sweetened condensed milk. Stir constantly for 5 minutes with a rubber spatula, scraping the bottom of the pan frequently while it cooks. This caramel will scorch on the bottom of the pan if you don’t stir it constantly and carefully scrape the bottom. While it cooks, it will go from a pale, thin mixture to one that is darker and much thicker. Scoop up a tablespoon of the caramel-coconut mixture and place it in the middle of each circle. 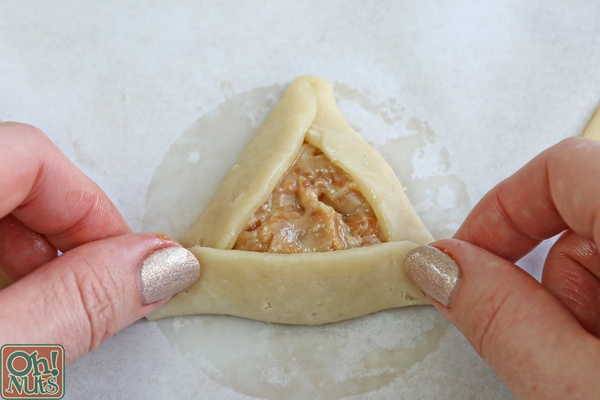 Fold the edges in to form a triangle shape, and brush the outer edges with more egg wash. Melt the chocolate wafers. Dip the bottoms of each cookie into the chocolate, and set them on parchment sheets. When all the bottoms are done being dipped, transfer the rest of the melted chocolate into a piping bag or a plastic bag with a hole cut in the corner, and drizzle the tops of the cookies with chocolate. Let the chocolate set, and then serve!